* Be careful, the name of folder “ArduBlockTool” under tools folder is case sensitive. I love your program and appreciate the work you have done very much! I just wanted to mention that I had a difficult time setting up Ardublock, because I did not realize that the folder names were case sensitive. I think if you stress in the instructions that all the folders must be labelled with the proper capitalization, people will find this is actually very easy to install. sorry but i have trouble to install ardublock!can you please help me? Thank you Lee, the post has been changed. i wanted to know is htis software easy to use than miniblogs arduino software. Very nice,now I can teach grade 7 student Arduino without any problem. Great idea, thanks for making it free, but how do I get it to work with Windows? Works with windows 7, this works great! its so easy now. I installed the software as per instructions and does not work. Any idea how to solve it please? Ok I solved the problem, I can load Ardublock. It looks great. Do you have an english tutorial? How did you solve it? I’ve installed on a Mac per instructions and it’s not showing up. Could you check the path again? I understand the path is a bit headache to get right… 🙁 Will work on an installer soon. Oh, I’ve checked the path a whole bunch of times and tried several variations. It’s just not loading. This is a work of art… Absolutley brilliant. Simple to use – and it looks superb. i had issues with arduino when running as normal user on my ubuntusystem. it works with rootpermission thou. 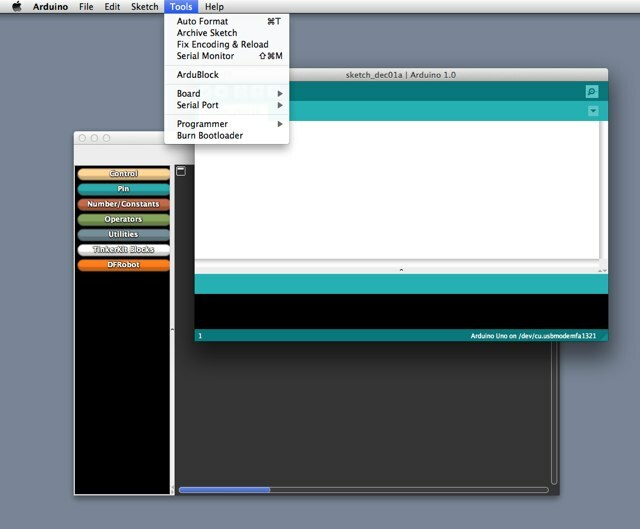 but then i had to put the file here: ‘/root/sketchbook/tools/ArduBlockTool/tool’ and run arduino as root. its propably not a good idea to do this – but – i dont care. THANKS FOR THE SOFT!!! I am an electrical engineer and work as a teacher in a technical school for electronics. We have a team that participates in robotics competitions and assists middle schools in creating robotics clubs. Our students work as monitors of robotics in these schools. We are starting to work with Arduino and we will work with the children using Ardublock. I would like to keep in touch with you to receive teaching materials and updates of this teaching tool. wow nice program and so easy setup, thanks guys. I’m trying to use variables, but Ardublock does not appear to declare the variable type? Is there another block that I’m missing? How do I delete a block? There doesn’t seem to be any way to do that. This is a very cumbersome program. First, if I want to change a block, there is no way to delete. Second, if I save, Ardublock starts in the program that I saved and there is no way to clear the screen. Also, the code doesn’t show for editing. I’m running Windows Vista. Please respond with answers. I’d like to use your program. Very nice program. Now it will be very easy for even non-programmers like 6-7th grade students to create projects using Arduino. For the love of God, keep writing these arelicts. i tried copying the ardublock file into the tools directory inside the arduino base folder, the very same folder where arduino is installed. The ardublock doesn’t show up? you can help my make program ardublock for sensor HC-SR04 with newping.h n ultrasonic.h? I am teacher in technology in France, with pupils 15 years old. It is their first programm. I need a evolution of Ardublock. I would like to have a block, in witch I could put the pah of a “librairy”. This sounds interesting. Can you elaborate? of course there are many blocks, but not too much. How to declare a variable wich is an output of the microcontroler. Because it’s more easier to programm with variable, than with bit 1 or 0. With delay and a variable, it’s not difficult. They will do only the main programm. For beginner, it will be perfect. I am having a hell of a time getting this to work for me. I’ve done 5 installations, triple checked the spelling of the files/folders, I mean it just won’t show up in the Arduino IDE! My OS is Ubuntu13.04 (64-bit) & Linux Mint 15 (32-bit). I cannot get ArduBlock to run on either of them. After crefully going over your instructions half a dozen times, I cannot figure out why ArduBlock will not appear under Tools. Help!!! I downloaded Ardublock last night and I had it up an running in minutes. This is a good tool, however the lacking of a delete block function makes it difficult to work with, specially when you plan to use it with kids, where they want to explore. So I wonder if there are any plans to add this functionality in the future? You’re back! great to see the website again – we just started using Ardublocks and are hoping that it will continue to be supported! Thanks! I’d love to learn more about your parctice! Anyone else not having trouble getting this working in the current version of the Arduino IDE? I’ve copied as per the instructions and it wont come up. I had it come up when I installed it under c:\program files(x86)\tools\ArduBlockTool/tool. in fact, it was still not working, error that it could not find the libraries. Hi this is my first time to learn with arduino, and hope to get help here. Thank you for this developer interface, I am going to use it with the Boys/Girls Club locally. I just guessed that I had to create the folder structure shown in the instructions for the destination of the download…and it came up in “Tools”. In one of your videos I see many more libraries in the left pane than I have. How do I get those and load them? Do you have a method of accepting donations? I like this and want to see more. I have a problem with Ardublock. I followed the Arduino installation do the installation ardublock in windows 10 and only appears to me the ardublock the first time, then get out of the Arduino and never have access to ardublock, anyone know how I can solve the problem? love your program and appreciate the work you have done very much! told the new user to actually create the following hierarchy of folders in the Sketchbook location: tools/ArduBlockTool/tool – then add the downloaded ardublock-all.jar file to the last folder. I havn’t used it now. The newer versions of the Arduino IDE do not work with Ardublocks. Since somewhere around Arduino 1.8 Ardublocks stops working. If you really want to use it you need to get the older version of the IDE. l love it. It is a nice program. Does ArduBlock work with Windows 10. I have tried to install it on my computer as per your instructions, but it does not appear in tools. Yes Ardublocks works with Windows 10 but as far as I know not with the newer versions of the Arduino IDE. It still works with Aruduino 1.6.5,but somewhere around 1.8 a bug came in which has not been fixed.